Goats are and aren't picky eaters. They will consume nearly any type of grass put in front of them, and they will chow down on weeds with just as much enthusiasm. That is the not-so-picky part. They are selective in their munching -- as they graze or browse through the forage in front of them, they somehow select and only eat plants at their fullest nutritional value. A mixture of grasses meets their needs. Bahiagrass tolerates drought well and grows in all types of soil. It is a competitive grass. 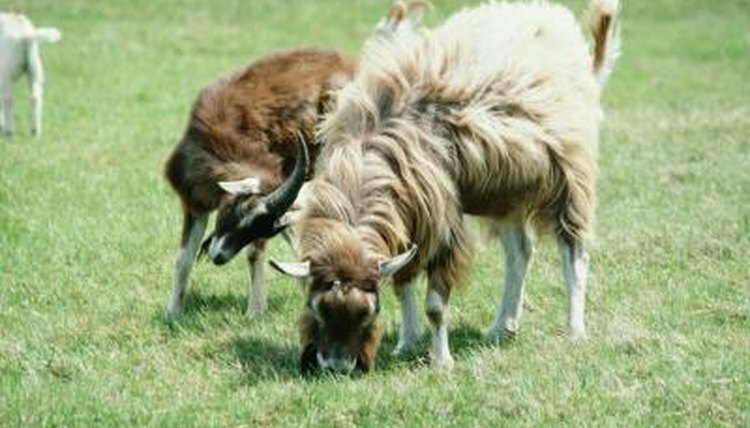 This isn't a desirable trait in settings such as lawns, but in a pasture trodden by the hooves of many goats, its competitive ability is helpful. It will grow in areas that other grasses will not. Thus, despite its lower quality as a food source, it will still be there in the pasture or scrub land areas when other grasses are gone. Millet, an annual grass, is a productive choice for producing winter hay for goats. It grows quickly, reaching 40 to 50 inches in 60 to 90 days if left alone. Mixed with other grass seeds for pasture land, millet provides a consistent food source once it has established itself at about 18 inches. Its digestible protein value is higher than that of corn and comparable to those of oats and barley. Fescue grass is highly tolerant of drought, insects and disease. This gives this grass the ability to persist in the field even when grazed heavily, as is common with goats. It is a cool-season perennial grass, which means it grows well in cooler and moist climates and does not require reseeding each growing season. Clover isn't a grass; it is a legume. Goats enjoy its sweet taste. Supplementing pasture land with clover seed is an efficient way to add stability to grazing areas. Clover is a nitrogen fixer -- its growth actually adds nitrogen to the soil for other plants to use. Its growth process protects the soil from erosion because it sends out stolons that cover the ground. It also stands up against a lot of foot traffic -- again a common occurrence with goats. Bromegrass is high in protein. It comes in two varieties -- southern and northern. The latter is suited to pasture land. It benefs pastures by building up sod with its deep and extensive roots. Its young plants are leafy; goats find them easy to digest.